Bust of Aphrodite. Aphrodite (Ἀφροδίτη) is the Greek goddess of love, beauty, pleasure, and procreation. Her Roman equivalent is the goddess Venus. On the left side is a head of a statue of Artemis, Neo Paphos Roman Period. Today in Cyprus Museum. Artemis was one of the most widely venerated of the Ancient Greek deities. Her Roman equivalent is Diana. 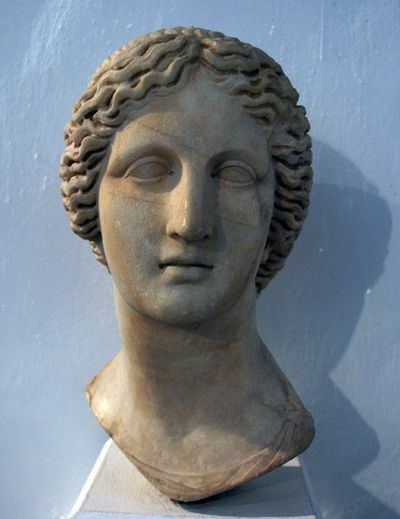 Some scholars believe that the name, and indeed the goddess herself, was originally pre-Greek. Homer refers to her as Artemis Agrotera, Potnia Theron: "Artemis of the wildland, Mistress of Animals". The Arcadians believed she was the daughter of Demeter. In the classical period of Greek mythology, Artemis (Ancient Greek: Ἄρτεμις) was often described as the daughter of Zeus and Leto, and the twin sister of Apollo. She was the Hellenic goddess of the hunt, wild animals, wilderness, childbirth, virginity and protector of young girls, bringing and relieving disease in women; she often was depicted as a huntress carrying a bow and arrows. The deer and the cypress were sacred to her. In later Hellenistic times, she even assumed the ancient role of Eileithyia in aiding childbirth. In top center is the coat of arms of Cyprus. 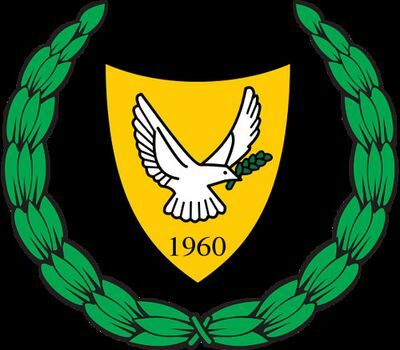 The coat of arms of the Republic of Cyprus depicts a dove carrying an olive branch (a well-known symbol of peace) over “1960”, the year of Cypriot independence from British rule. The background is a copper-yellow colour; this symbolizes the large deposits of copper ore on Cyprus (chiefly in the form of chalcopyrite, which is yellow in colour). The arms is not violating the rule of tincture, since the dove is not argent (silver) but blazoned as of the colour proper, i.e. it has the colour it would have in nature, in this case white. The name of the bank in Greek and Turkish languages. Lower is the island of Cyprus. In lower left corner are the flowers Cyclamen cyprium (please read about them in Reverse description). On the left side are three horizontal bars for visually impaired. Denominations in numerals are in lower left and top right corners. Centered in words. On the foreground, lower, is the green sea turtle. 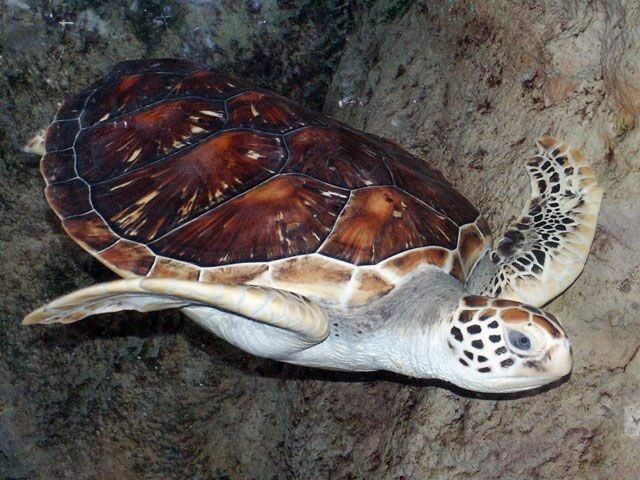 The green sea turtle (Chelonia mydas), also known as the green turtle, black (sea) turtle, or Pacific green turtle, is a large sea turtle of the family Cheloniidae. It is the only species in the genus Chelonia. Its range extends throughout tropical and subtropical seas around the world, with two distinct populations in the Atlantic and Pacific Oceans. The common name comes from the usually green fat found beneath its carapace. Centered are the Cyprus warblers. The Cyprus warbler (Sylvia melanothorax) is a typical warbler which breeds on Cyprus. This small passerine bird is a short-distance migrant, and winters in Israel, Jordan and Egypt. Like most Sylvia species, it has distinct male and female plumages. The adult male is a small typical warbler with a grey back, black head, white malar streaks ("moustaches"), and, uniquely among typical warblers, underparts heavily streaked with black. The female is mainly grey above, with a greyer head, and whitish with only light spotting. 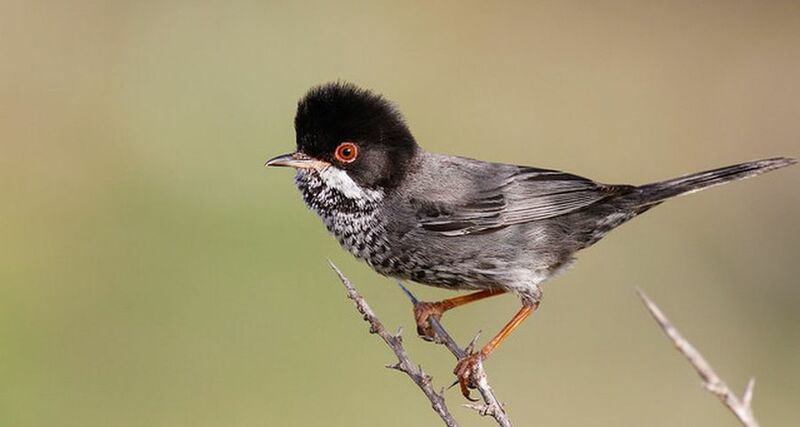 The Cyprus warbler's song is fast and rattling, and is similar to that of the Sardinian warbler. Together with Rüppell's warbler it forms a superspecies with dark throats, white malar streaks and light remiges fringes. This in turn is related to the species of Mediterranean and Middle East Sylvia warblers that have a naked eye-ring, namely the subalpine warbler, Sardinian warbler and Menetries warbler. Both groups have a white malar area, but this may not form a clear streak in the latter group; above the white, the heads of males are uniformly dark. This is a bird of dry open country, often on hill slopes, with bushes for nesting. The nest is built in low shrub or gorse, and 3-5 eggs are laid. Like most "warblers", it is insectivorous, but will also take berries. On the background, more to the left side, is Cyprus mouflon. The mouflons are very shy and agile; they move very fast on the steep slopes of the Paphos forest and are very difficult to approach, especially when they are frightened. The mature male mouflon is a strong, well-built and beautiful animal. It has a thick and plentiful hide which in winter is of a light brown colour, with light grey on the back and an elongated black patch round the neck. In summer its hide becomes short and smooth, with a uniform brown colour and white underparts. The male mouflons have heavy horns in the shape of a sickle. The length of the horns of the mature animals is between 55 and 60 centimeters. The weight of the male is around 35 kilos while the female weighs around 25 kilos. Its height is around one meter. 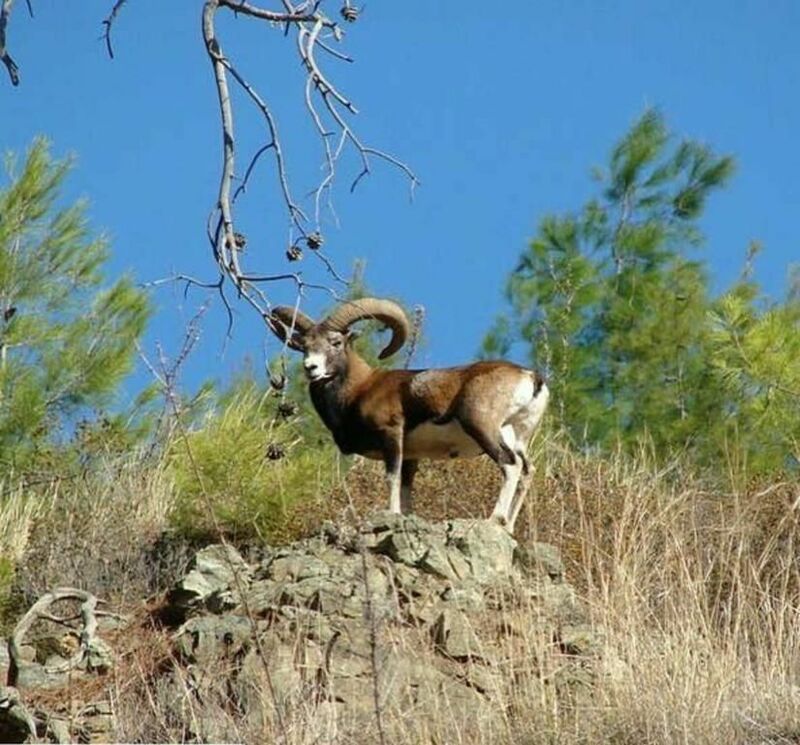 During the summer, the mouflons live on the high mountains of the Paphos forest, like the Tripilos region. The Tripilos Mountains stand at 1.362 metres and overlook the Cedar valley. In winter, when the high peaks of the mountains are covered with snow, the mouflons come down to lower pastures in search of food. At times, when there is not enough food in the forest, the mouflons venture to move to the edge of the forest to search for food. 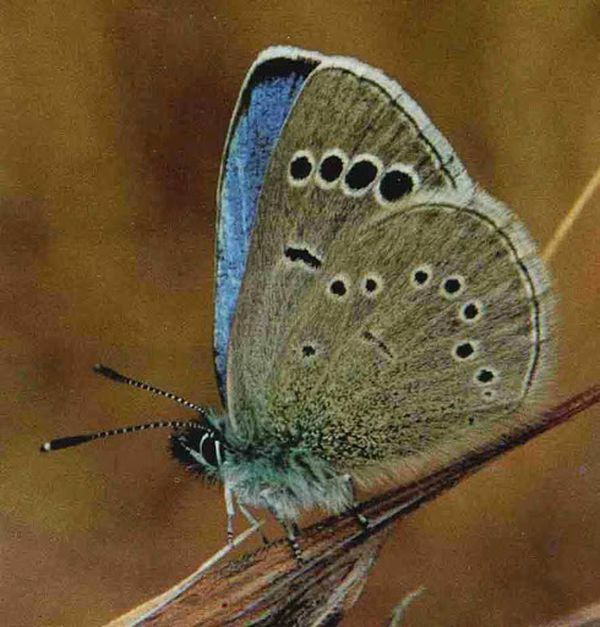 The butterfly Paphos Blue (Glaucopsyche paphos) is lower, on the right side. On the right side is Tulipa cypria. 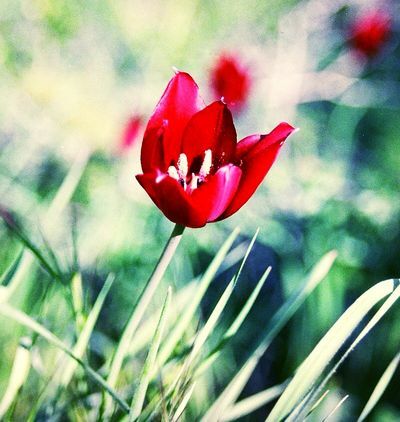 Tulipa cypria, the Cyprus tulip is an erect perennial bulbous herb, 15-40 cm high (in blossom), with glabrous, glaucous Leaves. The four leaves are alternate, simple, entire, fleshy, the two lower ones larger, laceolate, 10-20 x 2-6 cm, with conspicuously undulate margins, the two higher much smaller, nearly linear. One terminal showy flower, perianth cup shaped, of six free, petaloid segments, 2.5-9 x 1-3.5 cm, with dark blood-red colour, internally with a black blotch bordered by a yellow zone. It flowers March-April. The Fruit is a capsule. The Cyprian tulip Grows in Juniperus phoenicea maquis, pastures and cereal fields, on limestone at 150-300 m altitude. The plant is endemic to Cyprus, on Akamas, Kormakitis and some areas of the Pentadaktylos Range. It is very rare and strictly protected. Between butterfly and the warbler are flowers Cyclamen cyprium. The cyclamen wildflower, also known as cyclamen cyprium, is part of the endemic plants of Cyprus. 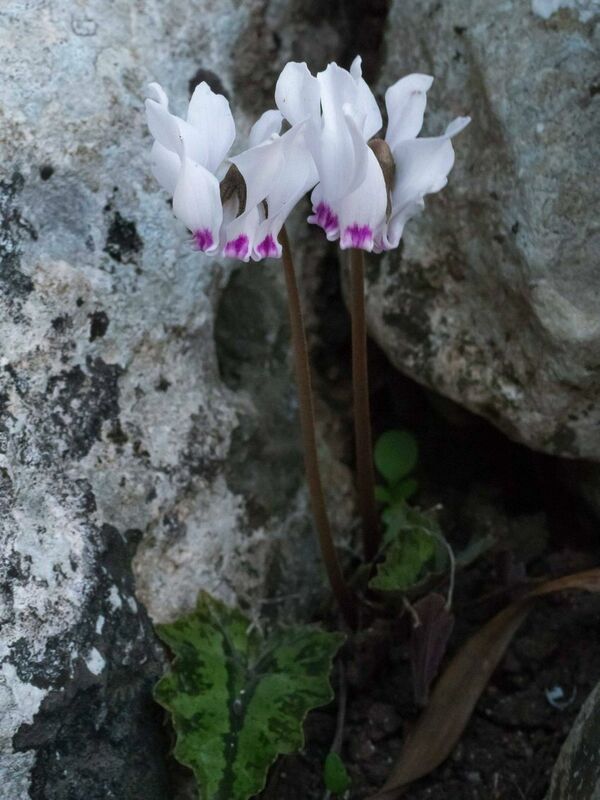 In Cyprus, there are three kinds of cyclamen species, but only the aforementioned one is considered as endemic. An endemic plant occurs regionally in a single place and is only restricted in that particular area, establishing the plant as very important for the Cyprus flora due to its rareness. The cyclamen plant flourishes in woodlands, under trees, through shrubs and rocky areas, on steep slopes as well as near steam banks. The cyclamen cyprium blooms from September until January on an altitude ranging from 50-1100 meters with a height of 7 to 15 cm. The leaves of Cyprus cyclamen are described as variably patterned leaves of deep purple to reddish color on the lower surface of lamina. Above the butterfly are flowers Allium neapolitanum. Allium neapolitanum (Naples Garlic, Daffodil Garlic, False Garlic, Flowering Onion, Naples Onion, Guernsey Star-of-Bethlehem, Neapolitan Garlic, Star, White Garlic, Wood Garlic) is a perennial bulbous plant of the genus Allium, the onion family. It is native to the Mediterranean Region and the Mid-East from Spain to Pakistan. Within Europe, the plant has been reported from Portugal, Spain, France, Italy, Greece, Turkey, Israel, Lebanon, Cyprus and the former Yugoslavia. The species is naturalized in other areas, including Pakistan, Australia, New Zealand, and in southern and western parts of the United States. It is classed as an invasive species in parts of the U.S., and is found primarily in the U.S. states of California, Texas, Louisiana, and Florida. It has been called Nothoscordum inodorum. Allium neapolitanum is cultivated by gardeners for its ornamental value. It produces round bulbs up to 2 cm across. Scape is up to 25 cm tall, round in cross-section but sometimes has wings toward the bottom. 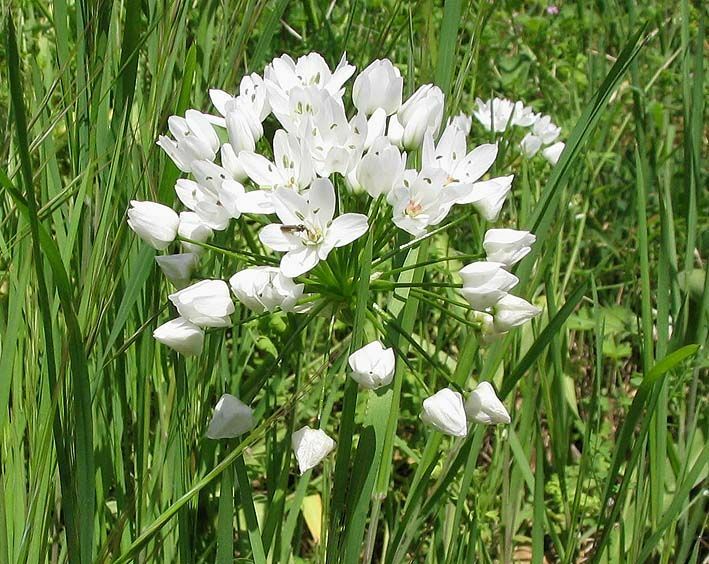 Inflorescence is an umbel of up to 25 white flowers with yellow anthers. In the lower left corner is stylized rosette. It looks not really like the rosette on 500 Mils 1974 , but. probably, it suppose to be the same one. In lower right corner are the stylized emblems of the Bank of Cyprus Cultural Foundation. "Through its emblem the Bank of Cyprus identifies itself with antiquity and the history of Cyprus, particularly its people (KOINON KYΠPIΩN - "Community of the Cypriots"). In the light of that and in the same spirit, the Cultural Foundation of the Bank of Cyprus uses an example of popular expression in art (depiction of part of a small skylight), contributing in this way to a holistic expression of the character of the island. As is only natural the sun, the kernel of life, should find functional expression in popular art since, over and above its metaphoric importance, it is also a characteristic feature of the country". The function of the skylight is directly related to the light that metaphorically expresses spiritual being. The very design of the archiere schematically describes the movement of the sun. The square, which is used to portray absolute stillness, surrounds a circle, which expresses perpetual motion. The two shapes (square and circle) are in harmony in their relationship to a common irradiating center. 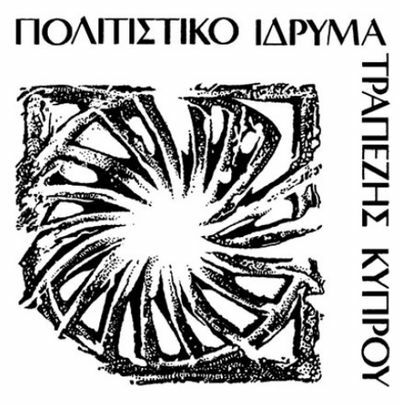 If the emblem is used with the words "Bank of Cyprus Cultural Foundation", the empty external space itself between the figure and the letters denotes the notion of movement, which is proportionate to the internal movement of the design itself. (The Bank of Cyprus Cultural Foundation). The British introduced the pound sterling unit to Cyprus in 1879 at a rate of one to 180 Turkish piastres. It remained equal in value to the pound sterling until 1972 and was initially divided into 20 shillings (σελίνι / σελίνια, şilin). The shilling was divided into 9 piastres (γρόσι / γρόσια, kuruş), thus establishing a nomenclature link to the previous currency. The piastre was itself divided into 40 para (like the kuruş). The para denomination did not appear on any coins or banknotes but was used on postage stamps. In 1955, Cyprus decimalized with 1000 mils (μιλς, mil) to the pound. Colloquially, the 5 mil coin was known as a "piastre" (not an exact equivalence) and the 50 mil coin as a "shilling" (an exact equivalence). 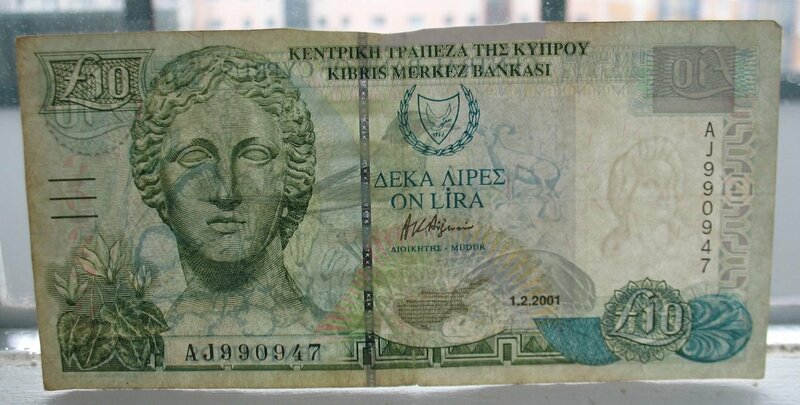 The subdivision was changed to 100 cents (σεντ, sent) to the pound on 3 October 1983. At that time, the smallest coin still in circulation was that of 5 mils. This was renamed as ½ cent, but soon was abolished. Mil-denominated coins are no longer legal tender.